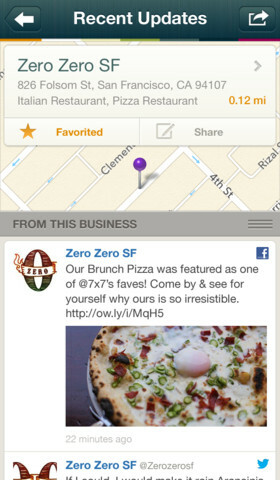 Spindle, an app that aids with social discovery, has just launched its latest version for iOS. It not only helps you explore the areas around you, it will be a great place for businesses to promote themselves and where they live on social networks like Twitter. The company has also raised a $2.3 million round of funding from an impressive list of investors: Polaris Ventures, Greylock Partners, Lerer Ventures, SV Angel, Atlas Ventures, Broad Beach Ventures, Project 11, Ray Ozzie and Raman Narayanan. We’ve been extremely fortunate to have patient investors. It’s taken a long time to get Spindle’s place database and search technology to this point and our investors have been in full support of us taking the long approach to go after something big. The company is full of ex-Microsoft engineers that have set out to change the way we think about the world around us. The app itself has its own database of places set on maps, including business and organizations. Got that? Not just businesses, you’ll find non-profits there, too. To be included in the database, businesses only need to provide interesting content on Twitter or Facebook. Easy, right? When you open the app, it knows where you are immediately. The system has complex algorithms that know which places are real and hopping and which places don’t really engage with customers or visitors. Here’s an example of something cool: If a business tweets “We have a special until 12 noon,” the system knows to surface them in your query. That’s pretty smart, and in fact, it’s something that Foursquare could really benefit from. Or Google. Or Microsoft. Right now, the service is available for Boston and San Francisco residents with more cities coming soon. The company posted today that the service is finally out of “preview”; I’m not sure what that means, but it definitely is a huge step forward. By focusing on the actual information and skipping the whole “check-in” part, Spindle has a leg up on competitors like Foursquare and Facebook. The app focuses on getting you to the right places that will really hold your interest and hopefully keep you coming back. One of the neat features is that the app knows when a company says to come on a “Tuesday” for something cool, and Spindle will then surface that place to you on a Tuesday rather than the day you checked. User Profiles: View your own profile to see your activity or view a friend’s profile to see what they’ve shared. Place Search: Search for a specific place by name to discover what’s happening there. 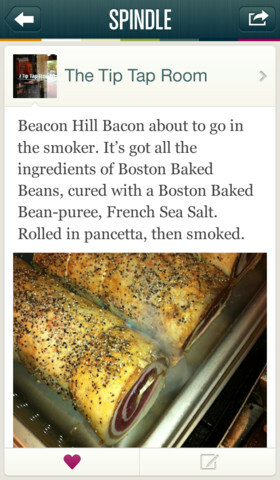 Simpler Sharing: You can now share directly from Spots feeds. And the Going, Here, and Share options now live on a single message composer screen. Share by Email & SMS: You can now share places and posts by email and SMS. Like: Like posts to save them to your profile and share with your friends. Discover your friends’ Likes in the activity feeds. Improved Location Selector: Now even easier to zoom in on a specific location and discover what’s happening there. Redesigned Menu: A better layout in the back panel. Your Favorites and friends are now at the top of the list. Faster Results: Query time has been cut in half. Report Data Errors: Notify us if we’re missing a place or social network account. New User Experience: Visual introduction to Spindle and streamlined signup process. Do we need another app like this? That’s always the question. But give it a whirl, and tell us what you think. The team is on to something huge. Microsoft’s own Steve Ballmer did say that the future of tech was in machine learning; maybe he’s on to something.